The "automatic stay" is a federal court order prohibiting debt collection as soon as you file your case. It is automatic because it requires no action by the court to take effect – it simply takes effect as soon as the case is filed. The kinds of actions prohibited by the automatic stay include phone calls, evictions, foreclosures, repossessions, filing a lawsuit, continuing a lawsuit, garnishments, freezing a bank account, and filing a lien against your property. 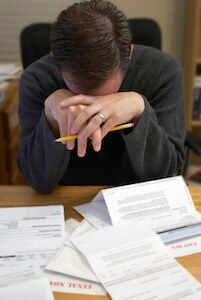 If a creditor tries to collect a debt from you anyway, they can be sanctioned in bankruptcy court. You can also ask for attorneys' fees and recover any money you lost because of the prohibited debt collection. To succeed in sanctioning a creditor, you have to provide notice to the creditor. The bankruptcy court will send the notice for you, but you have to list the creditor and provide their correct address for the court’s notice to be effective. There are some exemptions to the automatic stay. An action for child support can continue during bankruptcy. The IRS can “offset” a tax refund for a prior tax debt and can continue an audit (but not try to collect tax debt in any other way). In Washington, a Chapter 7 will not restore a license lost for unpaid tickets (though a Chapter 13 can, and the automatic stay will restore a license lost for an uninsured accident). If you file more than one bankruptcy within a year, you must ask the bankruptcy court to continue imposing the stay a month after you filed. If you file more than two bankruptcies in the last year, the stay will not take effect until you persuade the judge to impose it. Of course, to file more than one bankruptcy in a year, the first one must have been dismissed. A creditor can ask the court for relief from the stay as well. In a Chapter 7, a mortgage company or car company can ask for relief if you are behind on your payments. This takes at least a month. In a Chapter 13, a creditor can ask for relief if the plan is unfeasible, the payments are not being made, collateral is uninsured, or the plan does not comply with bankruptcy laws. The protection offered by the automatic stay is great. The exceptions are few, and even if a creditor can obtain relief, you will have plenty of warning that it is coming. It takes at least a month to obtain relief from the automatic stay. Bankruptcy could be the solution that's right for you. Visit our bankruptcy page to learn more, or call the experienced Seattle, WA bankruptcy attorneys at the Law Offices of Jason S. Newcombe to learn how we can help you.